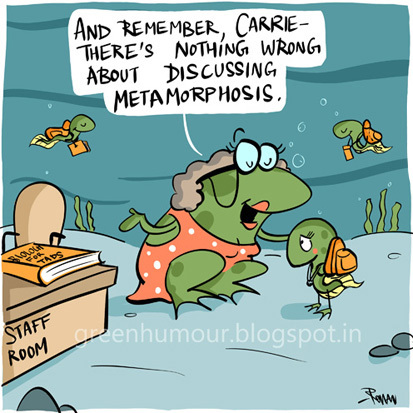 Green Humour: Happy Teachers' Day! The transition of a tadpole to an adult frog is a truly spectacular natural event. Frog eggs are laid as a globular mass that attaches itself to aquatic vegetation. The yolk nourishes the embryo until the larva breaks open and develops into a tadpole. In about 8 weeks, the hind limbs develop, which help the tadpole propel its body underwater. At about 9-10 weeks, the forelimbs begin to emerge, and this is when the tadpole starts to shed its tail by the process of apoptosis (programmed cell death). At around 12 weeks, the tadpole that has now grown into an almost tailless froglet, leaves its aquatic habitat. The whole transformation may claim upto a fourth of the tadpole's weight!